The Mithali Raj-led Indian team put up a stunning all-round performance to take the team to an unassailable 2-0 series lead against England at the Wankhede Stadium in Mumbai. After bowlers restricted the visitors to 161, Smriti Mandhana led the chase with a half-century with Raj giving her company. Brief scores: England 161 all-out in 43.3 overs (Natalie Sciver 85; Shikha Pandey 4-18, Jhulan Goswami 4-30) lost to India 162/3 in 41.1 overs (Smriti Mandhana 63, Mithali Raj 47*; Anya Shrubsole 2-23) by seven wickets. After England opted to bat first, Indian bowlers instantly proved them wrong as they reduced the touring side to 14/3 before Natalie Sciver and opener Tammy Beaumont forged a solid partnership in the middle. The duo managed to counter Jhulan Goswami and Shikha Pandey perfectly, but just when the opener thought that she had exerted herself perfectly, Pandey snared his wicket to reduce the Three Lions to 44/4. Lauren Winfield was industrious in her approach, and in the company of a solid Sciver, she guided the team to 93 runs before an attempt to sweep Poonam Yadav with the intention of clearing the boundary ended her stay in the middle. Sciver was relentless in her approach at the other end, forcing the Indians to err their length continuously, and despite the wickets are tumbling at the other end thanks to some magic by Pandey, she took the total beyond 160 and gave India a target of 162 runs. It was supposed to be an easy run-chase for the Indian team, especially because of Mandhana and Jemimah Rodrigues’ current form. However, the latter had an off-day in the middle as she failed to make proper contact with the moving ball before getting dismissed for a 10-ball duck. 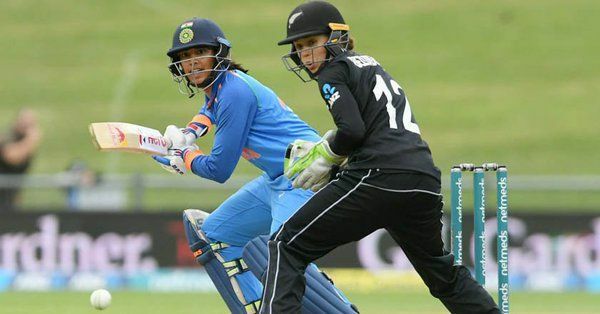 Mandhana then took the matter into her own hands and in the partnership with Punam Raut, she added a 73-run partnership to lay a solid foundation for the Indian chase. After Raut’s dismissal for 32, Mandhana got to her fifteenth half-century in ODI cricket with Raj at the other end, and the duo complemented each other’s effort to get India much closer. Anya Shrubsole bowled an inch-perfect yorker to end Mandhana’s stay in the middle and that was the last wicket England could pick, as Raj took the team down the line to hand a seven-wicket loss to England to win the series in advance.